There are many client opportunities at the Rosewood Therapeutic Horse Ranch. Several dozen Rosewood clients list Animal Care as one their primary responsibilities. Such responsibilities include involvement with the training and care of American Quarter Horses used in the Therapeutic Riding Program at the Rosewood Horse Ranch. Other opportunities include grooming the grounds with lawn maintenance, caring for the orchard and vineyard and harvesting honey on the Bee Farm to be made into products sold at the Wine Cellar. 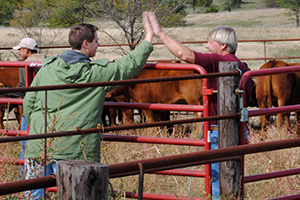 Some clients even help care for approximately 50 head of cattle throughout the year on the Ranch.